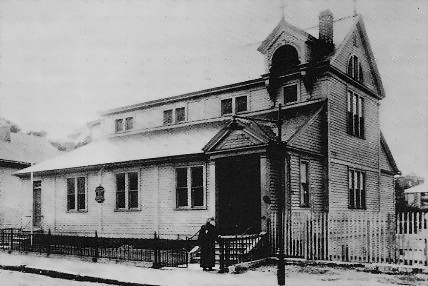 The first traditional Armenian church in America – Worcester, Massachusetts, 1891; an Armenian Protestant house of worship in the same town dates to a decade earlier. One of the most prominent elements of the Armenian world is the Armenian Diaspora, and the Armenians of the United States and Canada are among the most active communities spread across the planet. The earliest records date back to one “Martin the Armenian” who was brought in to the colony of Jamestown, Virginia, in 1618. Two more Armenians were invited in the following decades to experiment with raising silkworms in the New World. While there is more evidence of individuals in the 1600s and 1700s, Armenians did not make it en masse across the Atlantic to form organised communities until the mid-to-late-19th century and turn of the 20th century. American missionary work in the Ottoman Empire promoted Western education in the old country; the earliest demographic of Armenians to make it to the States, in fact, were students continuing on to college and university. A single record exists of an Armenian who took part in the Civil War – Khachadour Garabedian, fighting for the Union as an engineer in the navy, who came over in the 1850s and worked in a factory in Massachusetts. It was, naturally, economic opportunity that also served as a big draw for many to make the move. At the same time, increasing tensions, wholesale massacres (“pogroms”), and, finally, the Armenian Genocide, caused many Armenians to flee their ancestral homes and form nascent communities in Massachusetts, Pennsylvania, New York, New Jersey, Ontario, Michigan, and all the way to California, between the 1890s up to the mid-1920s.